In images on social media, Rahul Gandhi was seen holding the photographer and helping him up before going back. 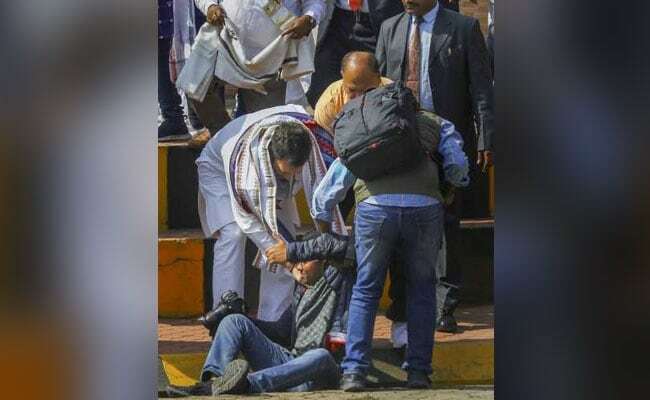 A photographer covering Rahul Gandhi's arrival in Odisha on Friday tripped and fell at the airport. Images show the Congress president rushing down the steps to help him up. The incident took place at the Biju Patnaik International Airport in Bhubaneswar. Hours later, Rahul Gandhi attended an Odisha dialogue. As the photographer suddenly fell backwards, security personnel surrounding Rahul Gandhi also rushed to help. Some initially thought at the commotion that it was the Congress chief who was hurt. In images on social media, Mr Gandhi was seen holding the photographer and helping him up before going back. Twitter was abuzz with some praising the Congress chief's gesture. Congress President #RahulGandhi rushes in to help a photographer who tripped and fell at Bhubaneswar Airport. Many compared it to the time when a police officer collapsed as PM Modi was speaking on stage. In Odisha today, unfortunately a photographer slipped & fell off the pavement and @RahulGandhi hurriedly rushed to help him, leaving everything aside & rightly so. Some people, however, criticised Mr Gandhi saying many others also helped the photographer. 1. Apparently his bodyguard pushed him. 2. It's expected basic human courtesy to help someone who falls like this. 3. Not only Rahul Gandhi, 10-15 other people too checked on the photographer but only Rahul Gandhi, the kind hearted man, will be highlighted. Mr Gandhi's visit to Odisha comes close on the heels of Prime Minister Narendra Modi's back-to-back visits to the state.